Thanks for downloading “4 in a Row” also known as “Four in a Line”. Four in a row is free! The matches are fast y funny. Very realistic game. You can play with another person or against the Artificial Intelligence module(Ai). This game is a two-player game in which each one chooses a different color for your chips and by shifts launches one at a time in a panel of 7 columns x 6 rows. The chips piling up in his column. 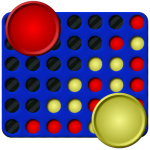 The objective of the game is to connect pieces of the same color forming a line horizontally, vertically or diagonally before your opponent does. Players start playing in rotating shifts.